Hello, friends! I love color and all things bring, bold and cheerful. As I was relaxing in my craft corner the other day I was inspired to make several Color Blocked cards (in a way, similar to this Valentine’s Day card I shared back in December). Color-blocking is thought of as the exploration of taking colors that are opposites on the color wheel and pairing them together to make interesting and complementary color combinations. If you think about it, there’s a wealth of options to be explored and lots of color combinations to be experimented with. All you need is pretty colored cardstock or means to make colored cardstock from white (using coloring mediums). To make the card I’m sharing today I first pre cut paper rectangles to 2 x 2 1/2″. I used several soft pastel colors of cardstock from Simon Says Stamp: Cotton Candy (pink), Sea Glass (blue), Lemon (yellow) and Green Apple (green). 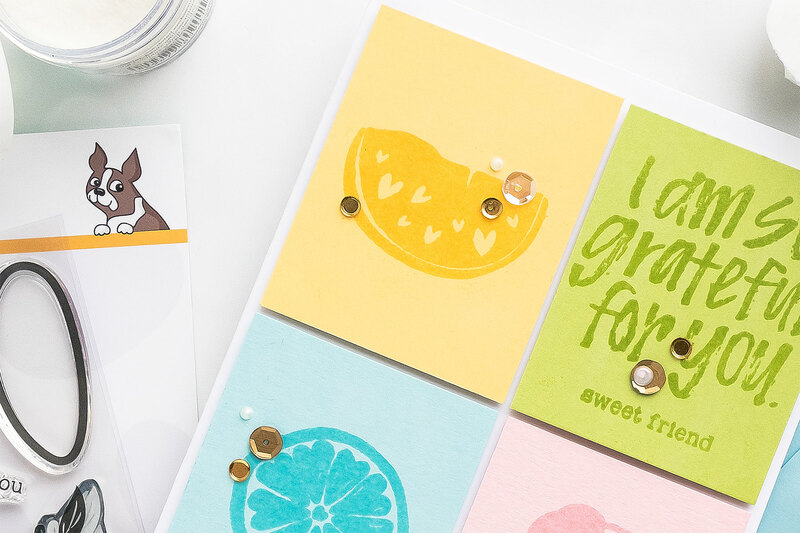 My idea was to have several fruit image panes and one sentiment panel for my card. 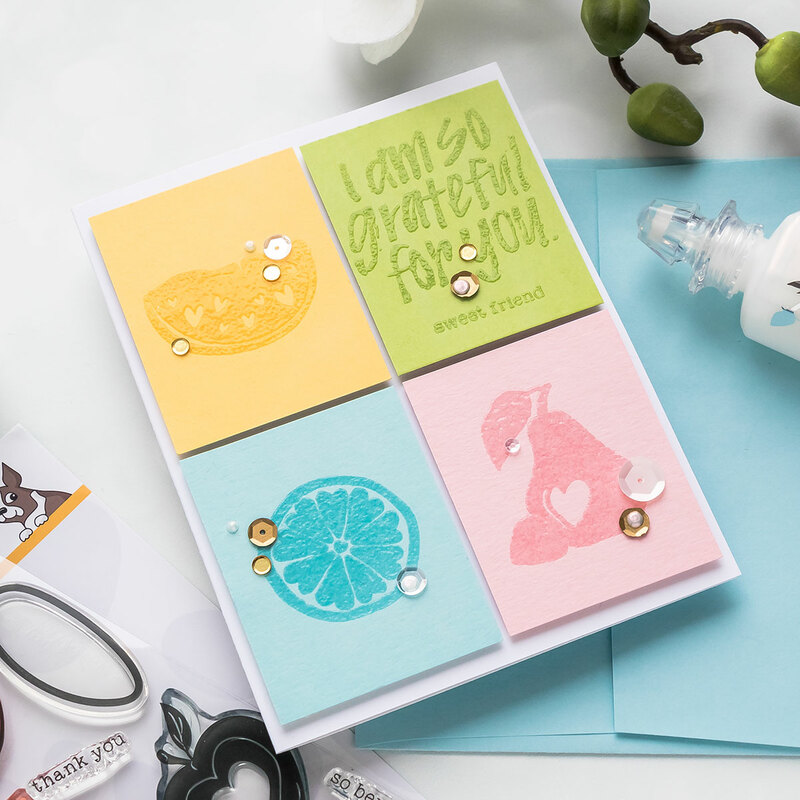 I selected a few fruit stamps from the Fruit from the Heart stamp set – a watermelon slice, a pear and a grapefruit and a sentiment that reads “I’m so grateful for you” from the Uplifting Sentiments set and “Sweet friend” from the same Fruit from the Heart set. I clear heat embossed each image after stamping it in clear embossing ink. This gave me beautiful tone on tone results that helped images pop on the panel, yet didn’t introduce another color to the color palette. 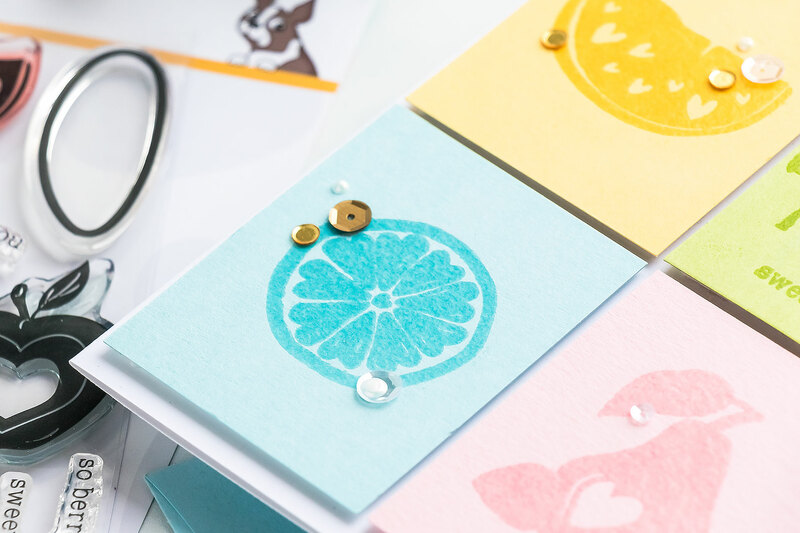 Once I had foam mounted these images onto an A2 white side folding card base I also added several sequins from Simon Says Stamp and topped everything with a few Dream Drops in Cloud 9 from Tonic Studios. Super cute!!! I love the tone on tone!! Very cute! This would make an adorable baby card, too, with different images and sentiment. Cute idea! I like the simple fruit stamps and the tone on tone embossing technique. Awwww, I love this! Love this set.